I have never rented a costume before and I am quite surprised when I visited a rental store today. My company will be having its first ever company dinner and as usual, departments are to put up events and off we went to rent some costumes for our performance. 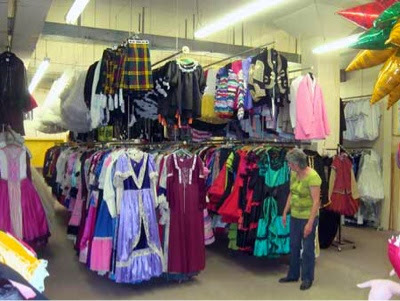 There is certainly a whole variety of costumes for rental and they seem to have quite a good business and demand as well. I am really not so adventurous and settled for a decent looking one. My colleagues look just absolutely fabulous in super hero costumes - Mrs Incredible, Batwoman, Captain America and Superwoman. The less super hero ones will be an apache, King Leonidas and myself as Princess Fiona. Today is really the most hilarious day of the year for me. I simply couldn't stop laughing. Someone said we should hang our colleague down from the ceiling as Superwoman. But I thought that would take too much work and preparation and said no, we could just lay her flat on her tummy with the hands stretched out on a roller table and just push her out. We nearly died laughing.